Mike Dean has been described as ‘Sculptor to the Stars’. Being self taught, Mike is proud to have been awarded commissions from people such as Elton John, Nick Faldo, Anthea Turner, Dennis Taylor and Tommy Walsh from Ground Force fame. 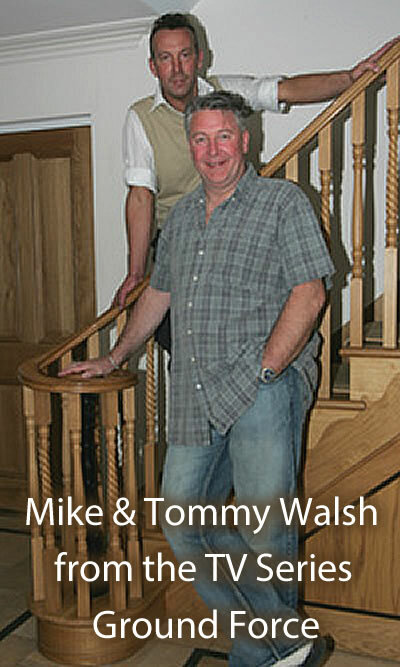 Tommy wanted Mike to make some splindles for his staircase and as Tommy liked two of Mike’s designs so much he had Mike combined them onto one spindle – giving Tommy a totally unique design. Another piece that Mike is especially pleased with is a 3ft bowl, which is now exhibited at the famous London restaurant La Tante Claire. The bowl was worked on while it was still wet; giving it a unique twisted and buckled shape. Mike made a large handmade stand together with a decanter and six wooden goblets, presented to the Reverend Dr Canaan Banana from Zimbabwe. Along the way Mike has collected many awards including both first and second in the 1995 British Gates and Timber Woodturning competition, third place at the 1996 Practical Wood turning Show at Wembley and one year later a second at the Good Woodworking Show at Alexandra Palace. Mike has come a long way in a career spanning over 30 years – and to think it all started with a rabbit hutch he made with his father.